Hearts to the Rescue: SOUTH CAROLINA - HELP THE ODD COUPLE MAKE IT OUT ALIVE - TOGETHER! SOUTH CAROLINA - HELP THE ODD COUPLE MAKE IT OUT ALIVE - TOGETHER! WHO ARE THEY? Talk about an odd couple! Felix and Oscar may not look like they belong together, but they are the best of friends. Oscar, the lab mix, is very outgoing and has never met a stranger. 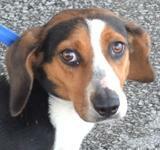 Felix, the beagle/Dach mix, is a little slower to love but wants to trust again. These sweet boys were surrendered by their owner and need your help now!